Kettlebells are weights that look like tea kettles and they have a handle on them. They come in different weight options and they are slowly becoming popular with people who love using weights to exercise. 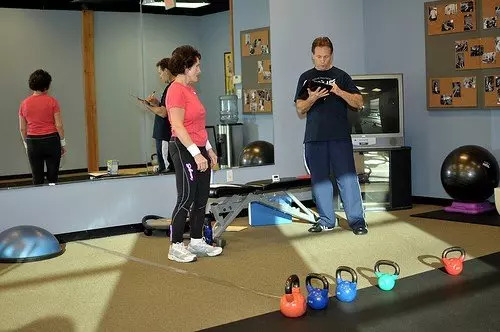 Many practitioners specialized in physical therapy in Connecticut have adopted the use of kettlebells in their programs and patients with muscle problems use them to exercise their muscles and to get back in shape. Kettlebell exercises use swinging movements and they usually help with abs, back and hips problems and they also work on the shoulders and legs. Most athletes suffer injuries on different parts of their bodies that may affect their ability to go back and do what they do best. After the initial treatment of these injuries, doctors advise them to go through a physical therapy to strengthen their muscles before they can be declared fit to compete again. This is a very sensitive time and if they were to use kettlebells incorrectly it would do more damage than good and so they are advised to work out under the direction of a physical therapist. To address a knee that is unstable you need to use the ballistic swing. This method strengthens the knee muscles both posteriorly and anteriorly. The ballistic swing makes muscles contract in an explosive way and this targets the type II muscle fibers, which is an emphasis for people with sports careers. One needs to ensure that they use proper mechanics at the ankle, knee and hip areas as a support in the kettlebell exercise to help in maintaining the correct technique. To strengthen a hip abduction the “high knee” exercise is used. High knee method strengthens the stance limb when force is applied in a downward motion through the contralateral limb. This is achieved by the contralateral forefoot being hooked to a dorsiflexed ankle to create a clutch under the kettlebell handle. Once again the ballistic kettlebell swing is used to promote scapular retraction. Shoulder health is termed to be remarkably complex and experts agree that scapular stabilization needs to be focused on. Ballistic kettlebell swing targets scapular retraction when it accelerates and decelerates in each swing repetition. Without scapular stabilization, it may lead to instability at the thoracic spine which would mean a person would be unable to maintain a form of exercise. You can apply all kettlebell exercises in your routine after the physical therapy and after your therapist gives you a clean bill of health. However, you need to be careful on how you use them to avoid future injuries to yourself. We wouldn’t want you back on the drawing board just after being released from therapy wouldn’t we? Kettlebell exercises will work almost all your body muscles if the instructions are followed and you can be sure to have fun too as you incorporate them in your workout schedule.